One night at work, I heard the woman in Room 4 weeping over her cat, which was being euthanized. I sat staring at the computer screen; the schedule read, “euth.” All the other patients had left and the radio had been turned off. The door had been locked, the cash box counted, the evening report printed. It was my first night alone with the doctors, my first time closing, and I waited for the woman to stop crying so that she could sign the papers and I could leave. I began working at the animal hospital the week we found out Abuela was going to die from her cancer. Abuela was excited for me, so I didn’t clarify how it wasn’t much of an achievement, it being a minimum wage entry-level position as a receptionist. Nor did I tell her much I disliked the work— how I couldn’t seem to handle the irregularity of emergency. Each time a situation arose, I felt torn apart, as if being stretched in opposite directions. While the other receptionists either sprung into calculated action or carried on with their tasks unaffected, I froze trying to figure out what to do, and I’d end up getting in the way or causing more confusion and trouble. I learned that the best thing I could do was to stand aside and wait as the professionals handled things, to be still while others rushed around me, like a stone at the edge of a river. They reassured me that I would learn what to do. But after a month, I still hadn’t gotten the hang of things. I spent my shifts watching and wondering how people carry on the way they do, handling death and mundanity in stride. I had never seen “dying” before, and Abuela was someone I’d loved most. I don’t know what I had expected exactly, but I didn’t think it would be like prodding fading embers, desperate for a last burst of warmth. I guess I had imagined a candle being blown out—whoo. But Abuela struggled to get out of her bed, her mind unwilling to accept the betrayal of her body. She’d furrow her brow and moan in her sleep. As much as I didn’t want to let her go, I wished that I could lick my thumb and forefinger, pinch the wick of her life, and release her. Abuela and I used to sit in her living room—her rocking in her recliner, me on her couch—and I’d tell her stories about my friends or my work or my creative projects. She’d listen, her eyes glittering with curiosity, and when I’d finish with one story, she’d take a deep breath and ask, “What else?” Sometimes I’d ask her about her own stories—about her escape from Cuba and the life she left behind there—but she didn’t seem to enjoy telling stories as much as she enjoyed listening to them. Knowing how much it pains me to tell stories about Abuela, I think I finally understand why that was. At the animal hospital, there was a shelf in the back room where we kept the boxes of ashes of deceased pets waiting to be picked up by their owners. Some had been sitting on the shelf for years. “We can’t get rid of them; they paid for them,” a vet explained to me. It’s not cheap to have your pet cremated. So the boxes remained on the shelf with their clay paw prints tucked inside. How could someone just leave them? I wondered. They certainly wouldn’t have forgotten them. It’s not that it pains me to remember Abuela, although I am certainly still grieving; it’s that memory itself pains me. I am pained that the mundane moments that composed the days of our relationship fade with each remembering. I am pained that when I wake from a dream about Abuela, her unreal presence feels more real to me than her real one. I am pained that the memory of her death remains more vivid than any other memory. To revisit memories of Abuela means to feel more loss. All I want to feel is joy when I think about Abuela. I sat weeping in the car before I entered the hospice center where Abuela was moved. I remember thinking, as I heaved sobs propped up against the steering wheel, that this was only the first of many deaths that I would have to endure. I imagined grasping my father’s weathered hands, kissing my mother’s wrinkled forehead, whispering into my friends’ shriveled ears. I imagined being at my own end, my body heavy, and feeling the weight and loneliness of not just my memories, but the absence of memories—an intangible, unfathomable accumulation of losses. It occurred to me: “euth” isn’t just the humane choice for the dying, but for the living, and thus for the dying twice fold. 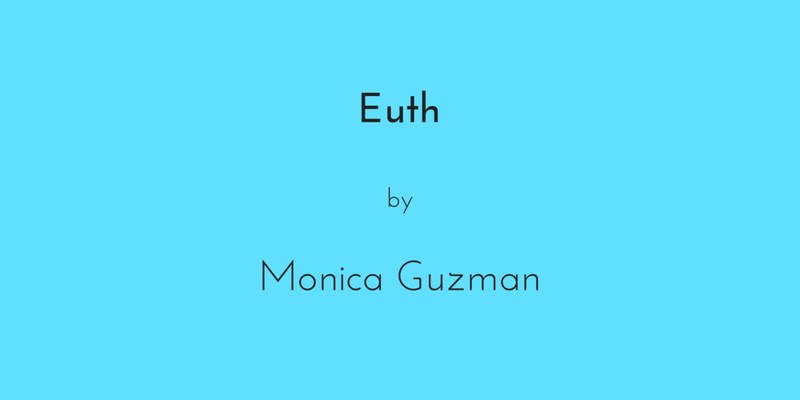 Euth: the power to override death so as to prevent death from overriding memory, the memories that live on. Before she got sick, Abuela would ask, “Will you remember me?” Of course I will. Of course I do. But I wonder if I could remember better. I wonder if Abuela would have chosen a different ending for herself if she knew how powerful her death would be. I watched Abuela sleeping in the hospital bed next to me. Her mouth hung open and her chest heaved gurgling breaths. Even though it was unlikely she’d open her eyes again, even though I had been there at her bedside for too many hours, I couldn’t bear to leave because I couldn’t bear the idea of missing a chance to tell her one more time that I loved her and to assure her that, if she felt ready, she could keep moving while I stayed here.